The other day my husband walked into the house with a look on his face that I can only describe as stricken. I sat up straight, suddenly on alert. My husband isn’t one to be visibly upset very often – not unless it is really bad. “What’s wrong?” I asked, mentally going through the things that could be going wrong: elderly parents, kids, our business, our home. “I got a squirrel killed.” He replied, clearly upset over this, um, tragedy. 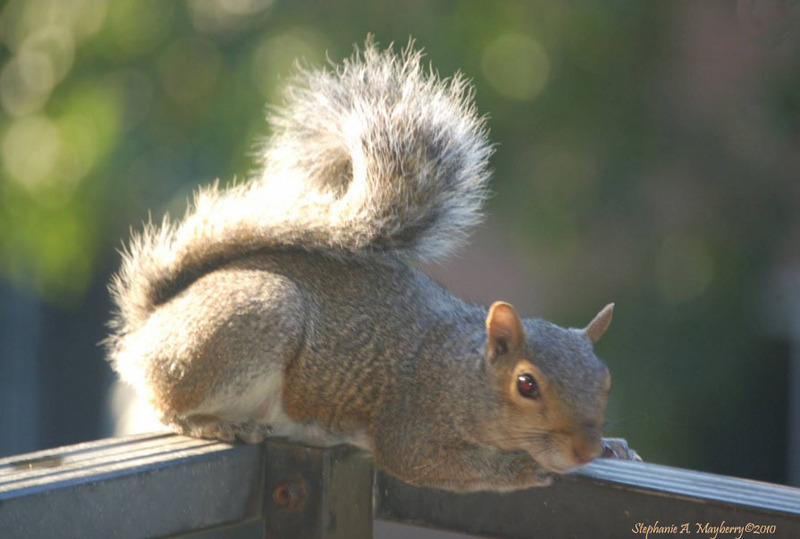 “I got a squirrel killed.” He watched me, watching him as I waited for further explanation – and understanding of how this was such a traumatic event. Even he, as a pest control professional and business owner, had referred to them on more than one occasion as tree rats. He continued. “I distracted it and a cat came out of nowhere, pounced on it, and dragged it off into the bushes.” Ah. Yeah, I don’t ask anymore. My husband is a wonderful, brilliant, compassionate man with the most amazing sense of humor I have even encountered. His quirkiness matches my quirkiness and it is one of the main things that made me fall in love with him in the first place. He had been outside cleaning the grill; I’m not sure how he went from that to squirrel killer – or accomplice. And that is how we wound up on the squirrel mafia’s hit list. It did get me thinking though. How many times have we started a marketing strategy or embarked on a business building project only to get distracted by things? Distracted marketing can be death to a business. Sure, there is no large, white man standing in your front yard, waving his arms shouting “Hey squirrel,” but there are other things that can draw our focus. Business issues as well as personal issues can cause us to take our eyes off the goal – and off of the predators (also known as competitors) that are lurking, lying in wait, ready to pounce when you get distracted. We tell our kids to keep their mind on their studies. The media is always warning us of the dangers of distracted driving. Experts scare us to death with horror stories about distracted parenting. What about distracted marketing? You don’t hear so much about keeping your marketing focus sharp. It is important though. Small businesses are particularly vulnerable to competitor attacks. You can’t afford to stop assessing your surroundings in order to give your attention to a large white man waving his arms and calling to you, lest the cat slip from its hiding place and destroy you. So how can you keep your focus in this increasingly distracting world? Yeah, everyone says set goals – and it’s really good advice. Set marketing goals, not just for what you will do at each stage of your marketing campaign, but what you expect to accomplish. Sure, this is Marketing 101, but sometimes it is necessary to return to the basics. Put everything in writing, your strategy, your goals, your benchmarks, everything. When you have ideas or make observations, write them down. Keep it all in a file and actually use the information. Find a way to organize your notes so you can access them easily. While some of your observations or comments may not work on this campaign, they may make all the difference for the next one. Create alerts on your phone, Google calendar, all of your time management tools. Small business owners tend to wear a lot of hats and when they get caught up with wearing one attention demanding hat the others can suffer. Marketing is often relegated to the end of the line, an afterthought, but it should be a priority. If you don’t market you won’t have any customers to serve so carve out some time each day to work on it whether it’s your content management, social media scheduling, or updating your website. Set an alarm and just do it. There is a difference between being vigilant and being distractible – and you need to find it. This is the beauty of carving out specific time to devote to marketing your company. For that time, those two or three hours – or whatever – you don’t have to pay attention to anything else. Unless there is a true emergency, anything can wait for a couple of hours. Put on those blinders and keep your focus on your marketing. Back to Marketing 101, but you need to hear this. Too many small business owners painstakingly create their marketing strategies and set them in motion only to pull an ostrich mama move and abandon them. Your marketing campaign needs your hands on it every single day. Yes, every day you need to do something related to marketing your business. Work on your blog, update your website (the majority of business owners do not update their websites nearly as often as they should), or engage your customers on your social media channels, but always, always monitor and measure to see how your efforts are working. Don’t fall victim to distracted marketing; it is something that is completely avoidable. You took the time to plan your business, put that plan into action, and make it work, do the same with your marketing. And keep your focus. Have you ever fallen victim to distracted marketing? What strategies do you have in place to prevent it from happening?